TAIPEI, TAIWAN --South Korea returns to the 2016 Williams Jones Cup to defend their crown. 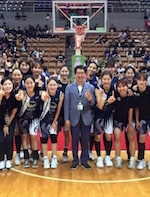 South Korea celebrated the 2015 William Jones Cup title. They rallied past Taiwan Blue side in the final game of the tournament. Kim Jung Eun (180-F-87) was named MVP. Below is the 2016 South Korea National Team. NANTES -- At the young age of 25; Kristina King (180-G-92, college: Richmond) has turned her career into things that legends are made of. 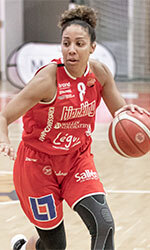 She recently signed in France to play for Reze. Prior to France she has played in Romania, Iceland, Switzerland, Spain, Lebanon and now France. In 2016, King was named AsiaBasket.com All-FIBA Jones Cup Top Player after averaging an event best 20.0 points per game along with 9.8 rebounds. Last season she started for the Chabibeh Sporting Club in Lebanon. She was the ultimate threat averaging a league best 27 points, 10 rebounds and 7 assists. AsiaBasket.com would again name her league MVP for her efforts. We have talked with the Richmond graduate about her career and future expectations. -What do you think the highlight of your career has been? A: I think the highlight of my career thus far was playing in the Williams Jones Cup and winning Top Player at such a prestigious event. Having competed against the top players from National Teams such as Japan and Korea was a great challenge and being able to perform and lead the event in scoring was a big accomplishment. Being in that atmosphere and having a packed stadium every night was an awesome experience. I hope to go back again soon and get the opportunity to win gold! -The opportunity to play in a Olympic event, and with so good results, was a goal you searched in your career? A: Being able to compete at the highest level against the best of the best has always been a goal in my career. When the opportunity presented itself to compete in the Williams Jones Cup - I had to make it happen. It's a test for you to reach that next level of growth as a player not only physically but mentally too. Going against such a talented group of players each night in packed stadiums was something every athlete dreams ofl - mine just became a reality and that is something no one can ever take away from me. -What is the secret to your growth as a player? From under the radar to being posters in McDonald's (France). A: I think dedication to the game and trusting that everything I put into it I would get back. Basketball is a game you can't cheat. If you cut corners, it will show in the results you get. So having dedication to work every day on my craft and not get bored really sets you apart in this day and age where so much of the world is driven by social media and perception. Lots of people post what they are doing but few are actually doing the work. I also credit a lot of my growth to the mentors I was fortunate enough to network with when I was at the Williams Jones Cup. They helped me learn not only how to transform my game but also the industry itself. So I think dedication to my craft and getting linked up with a great group of people really transformed my growth as a player. -You had a great College career. Which main differences do you see between the NCAA and European game? A: I think the level of physicality is very different. In the NCAA - it is very physical and lifting/weight-training is a part of our every day workout regiment. Overseas it isn't as common. The game is much more finesse. It's also a difference in style of play. Europeans are very efficient when it comes to shooting and you see a lot of stretch 3s and 4s in the game where in the states it's a lot of pounding inside. Overall though, on both sides it is extremely competitive. It was interesting though to see the differences in ages at the pro level in Europe. Whether you were 17 years old or 35 years old, if you can play you can play. It's cool to see girls competing at such a high level from a young age and on the flip side getting to see and learn from veterans who have a lot of experience in the game and can teach you. -Did you have problems adapting to European basketball? A: It was tough getting adjusted to the traveling calls because it is different from American basketball. Other than that, basketball is basketball. Although I will say to anyone looking to play overseas - learn to play and finish through contact. -You attended Atlanta Dream camp in 2016. Do you still have dreams of making the WNBA? A: That is always the ultimate goal. It would be a big achievement to make it into the WNBA where the best of the best compete. I do love being in other countries though and experiencing new cultures and getting to travel so I will always keep doing this. - So many female professional players go through ACL injuries. We recently saw one with Atlanta Dream super Star Angel McCoughtry (187-SF-86, college: Louisville). Being one of those players who had to battle back from an injury. What would be your advice to the next generation player who loses their confidence when injured. A: Battling back from an injury isn't easy. It's a lot of hard work with good days and bad days. I would say that to come through an injury and bounce back you have to stay positive, surround yourself with good people, and celebrate little victories. When I could successfully lift my leg - I celebrated. When I got off crutches and could start walking again - I celebrated that. When I could start running again - I celebrated that. It's in these small victories that the long process doesn't become as overwhelming and having people around you that not only push you but help you stay focused and not get down on yourself is a big key to success. New Zealand won the William Jones Cup title. They outscored Japan to finish the tournament undefeated. Ashleigh Karaitiana (183-G-92, college: Hawaii) scored 25 points to lead the Tall Ferns. Stella Beck (183-G-95, college: St.Mary's, CA) added 24 points, 7 assists and 5 rebounds in the victory. Japan accumulated a 46:35 halftime lead. But New Zealand turned things around in the second half. They went on a 28:12 run in the fourth period to secure the victory. Mio Shinozaki (167-PG-91) delivered 20 points for Japan. Taiwan B overcame India to finish the tournament on a high note. Yu-Chun Wei (173-F-92) posted 20 points to lead the charge. Taiwan B accumulated a 44:21 halftime lead. Taiwan B dropped 28 points in the fourth term to seal the win. Liu Xi-Ye (172-F-91) had 17 points in the victory. Pushpa-Senthil Kumar replied with 16 points and 11 rebounds for India. Taiwan defeated South Korea to earn the third position at the tournament. Peng Szu-Chin (163-G-91) stepped up with 19 points to lead the hosts. Taiwan accounted for a 38:28 halftime lead. They followed with a 23:14 run in the fourth stanza to ensure the victory. Liu Xi-Ye delivered 18 points for the winners. Lim Yong-Hui (178-F-80) banked in 20 points for South Korea.